And now we come to my favorite Chaplin feature, City Lights. 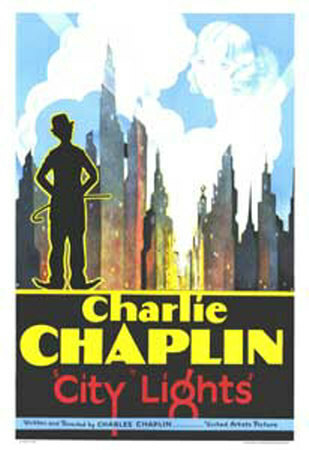 To me, this film is the perfect blend of comedy and drama and a definitive example of the genius of Chaplin’s work. Everything comes together in this film so beautifully, both comic and dramatic devices, that I can not only call this my favorite Chaplin film, but rank this in my top 10 favorite films of all-time. Like many of Chaplin’s films, the actual plot outline is relatively simple; it is the execution that makes this film a masterpiece. The story revolves around Chaplin’s character of the Little Tramp, who falls in love with a poor, blind flower girl (Virginia Cherrill). Through a hap circumstance, she believes that he is a millionaire and can help her and her mother in their desperate time of need. Determined to help, he befriends a raucous, party-driven millionaire and does everything he can to help the flower girl and her mother. In the end, he helps them and she is able to get an eye operation that restores her sight. But, will she be able to accept the Tramp for his true self? By the time this film was in production, and definitely by the time it was released in 1931, sound in motion pictures was in full stride. Silents were, essentially, becoming a thing of the past. However, though the option for sound was fully open to Chaplin before filming began, he decided against making a sound film because he felt that the Little Tramp character speaking would ruin his entire appeal. Turns out that Chaplin made a wise decision, as City Lights was an immense success both commercially and critically. As for production, this film took the longest of any other Chaplin film to complete at nearly 180 days of filming from late 1927 to early 1931. Several story points, including how to show the blind flower girl mistaking the Little Tramp for being wealthy, plagued Chaplin; the integral scene of this story point was re-shot 342 times for perfection. Another issue for Chaplin was his dissatisfaction with Virginia Cherrill in the lead role as the flower girl. 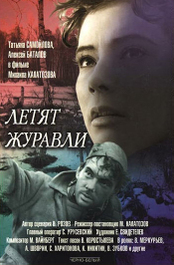 At one point, he even went so far as to replace her with Georgia Hale; however, once realizing that too much footage was in the can and it would cost a fortune to reshoot all her scenes, he asked Cherrill to come back on board and finish the film. Ironically, before coming back on board, Cherrill made Chaplin renegotiate her contract for more money than she was originally to be paid, something that surely didn’t help her and Chaplin’s professional relationship. In the end, Chaplin did decide to utilize something out of the sound on film devices available, as he recorded a score and several sound effects for the film that accompanied the picture. However, no audible dialog made the final cut, only garbled talking at the beginning of the film performed by Chaplin himself. In the 80 years since this film was released it has received a number of commendations and places on top film lists, including being ranked #11 on the AFI’s Top 100 Best Movies of All-Time List and #1 on their list of Top Romantic Comedies. In addition, Orson Welles was quoted as saying that this was his favorite film. Needless to say, City Lights has definitely stood the test of time and continues to dazzle, cheer and touch audiences of all ages and from around the world. The Circus is one of the lesser-known comedies by Chaplin during his golden age of feature making in the 1920s and 1930s. Though more obscure to most audiences than The Kid, The Gold Rush, City Lights or Modern Times, this is still an incredible comedy drama. Chaplin returns as the Little Tramp in this film and, at the beginning, is mistakingly suspected as a pickpocket. 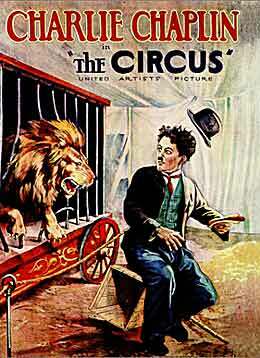 A chase with the police ensues that leads the tramp to a traveling circus tent. In the midst of the chase, the tramp stumbles onto the middle of the circus stage and, unknowingly, becomes the hit of the show. After averting the police, the tramp is asked by the flailing circus’s proprietor (Allan Garcia) if he would like to become part of the group; the tramp agrees. However, the tramp can only be funny when he doesn’t intend to be. So, though he becomes the star of the show, he can’t give his talents on beck and call. In the process of his tenure with the circus, the tramp develops an infatuation with circus rider and step-daughter to the proprietor (Merna Kennedy). The tramp seems to have won her interest until a new tightrope walker comes to the circus named Rex (Harry Crocker). Will the tramp be able to win the heart of his love or will he be beat out by the new man on campus? The Circus began filming in 1926, but was marred by a slew of production related and non-production related problems. In September 1926, a large fire broke out in Chaplin Studios that burned much of one of the main sound stages. This delayed production for well over a month. 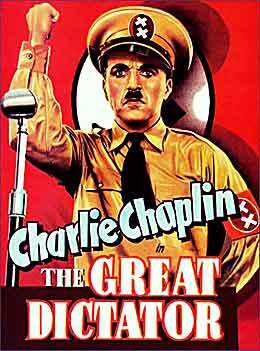 Furthermore, it was during the post-production phase of this film that the bitter divorce between Lita Grey occurred and the federal government was coming down hard on Chaplin concerning tax problems. Also, during this time, Chaplin’s beloved, though mentally unstable mother, Hannah, passed away. These circumstances combined resulted in a delay of nearly one year for the film’s release theatrically. Upon release, the film was well-received and ended up being one of the top ten highest grossing silent films of all-time. With Chaplin’s masterful acrobatics and physical comedy in full form, it is a wonder why this film doesn’t retain the same level of grandeur in audience’s minds today as several of his previous and forthcoming titles. For his performance, direction, production and writing, Chaplin was nominated for Academy Awards (at the first Academy Award presentation no less). However, the Academy eventually retracted all four nominations and gave him a Special Award for “writing, directing, producing and starring in The Circus.” To this day, the Academy does not acknowledge the nominations for this film originally given, only the Special Award. Any Chaplin lover, or lover of silent comedy for that matter, should not pass this film up if they get the opportunity to see it. Though you may not have heard of it or heard of it less than other Chaplin titles, it’s thrills, comedic precision and touching slice-of-life presentation will not fail to impress.